Santa Monica, a neighborhood filled with organic cuisine, expensive shopping and overtly trendy Westsiders, might just be one of my favorite spots in Los Angeles. It isn’t just the raging bar scene or the endless sunshine that keeps me coming back. It’s the local shops, cliff side beach views, irresistible sunsets and the ultimate ‘California vibe’ that leaves me wishing I lived in this affluent and eclectic city. Read more about what Santa Monica has to offer in my ultimate guide to Santa Monica! The Upper West – If you’re looking for one of the best happy hour spots in LA, look no further! Upper West has an awesome all-night long happy hour on Monday and regular hours on the weekdays. The food is amazing on the happy hour menu and there’s no shortage of delicious dinner selections. The Misfit Restaurant + Bar – My favorite restaurant in Santa Monica is in the heart of the biggest tourist spot in Santa Monica. The Misfit it a New American restaurant with a 1920s speakeasy vibe with some of the best cocktails you’ll have along with their homemade chocolate chip, sea salted cookies. Tar & Roses – One of the most unique, delectable restaurant experiences you could have in Santa Monica. Tar & Roses serves crazy concoctions like honeycomb ice cream, lemon ricotta gnocchi and oxtail dumplings. And the cocktails will absolutely blow your mind! Sidecar Doughnuts – A fairly new establishment in Santa Monica, Sidecar Doughnuts is the newest cafe for all things coffee and doughnuts. Don’t expect greasy, crumbly doughnuts here. These boutique and freshly made doughnuts hit the spot. Plus, their coffee ain’t bad either. Blue Daisy – You haven’t truly been to Santa Monica unless you’ve brunched and Blue Daisy is the ultimate breakfast spot. Blue Daisy has bacon bloody marys, large mimosas, sweet crepes and fantastic benedicts. And in true California-fashion, you have plenty of gluten-free and vegetarian options here. The Bungalow – The new staple of the Santa Monica bar scene as it all: a beach view, trendy decor, delicious cocktails and an elite, Westside crowd. Of course being seen at this trendy environment may not be your cup of tea, but you won’t witness a better sunset (unless you’re on the pier’s ferris wheel). Annenberg Community Beach House – This public beach facility was once a celebrity retreat in the 30’s and 40’s. Now, beach goers visit Annenberg for its recreational space and impressive views of the Pacific Ocean. Santa Monica History Museum – One of Santa Monica’s 3 museums is the History Museum, filled with cool facts about this bustling, beachside city. Included is even some information about the very first Hot Dog on a Stick (which just so happened to be my first job)! Santa Monica Airport – Alright, this one might sound weird, but hear me out. Santa Monica Airport might be, first and foremost, an airport. But this place has got a lot more than just planes. Along with the museum of flying, the Santa Monica Airport has 2 parks, 2 restaurants, event spaces, flying schools and a section of Santa Monica City College. It’s a very unique place to enjoy your lunch so if you have a curiosity to explore some really local parts of Santa Monica, check this place out! 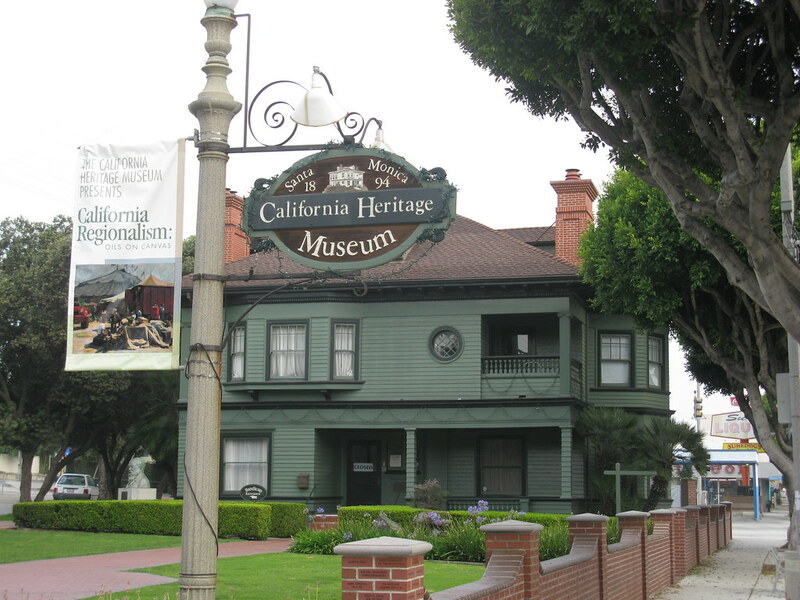 California Heritage Museum – Walk into a Victorian/Colonial home built in 1894 to find some of California’s greatest legacies and history. From the fun ‘Awkward Family Photos’ exhibit to classic Mexican American pottery, this museum has both fun and fascinating exhibits that are unlike any other museum. Santa Monica Beach – Not only is this one of the most iconic beaches in Los Angeles, but it also happens to host some of the hottest events of the year. Santa Monica Beach is the ultimate place to see and be seen whether it’s summertime or all year round. Pacific Park – Located right in the center of Santa Monica Beach is the Santa Monica Pier, home to the amusement park Pacific Park. Another event hotspot and tourist-friendly attraction, Pacific Park is home to several rides, games and carnival-like eateries. Palisades Park – Palisades Park is a wonderful place to take in the view of the famous PCH freeway and Santa Monica Beach. Palisades Park is open to all walks of life, where you’ll find dogs and owners on a walk, buskers earning some money and tourists enjoying the view with their cameras. Farmers Markets – Santa Monica has several markets to cater to the local’s busy schedules. You can find various farmers markets around the city on Wednesdays, Saturdays and Sundays all in different spots of Santa Monica. Not only do these markets have great, organic selections, but you’ll also get a real taste of Santa Monica’s street scene. Community Gardens – Santa Monica is quite a small neighborhood when you look at it on a map, so it’s only natural that locals look to their local community gardens to grow their own organic food and foliage. This is not a tourist destination by any means, but it you’re looking for real Santa Monica culture, look no further than Ocean View Farms or the Santa Monica Community Garden. Chris + Mary – This namesake shop owned by Chris and Mary on Pico Blvd features sweatshop-free and small batch clothing, gifts and jewelry. They carry local LA brands and curated, artisan goods from all over the world. Santa Monica Place – If you’re looking for your typical brand names, this is a great shopping spot. It’s also a great place to hide from the summer heat when the tourists are sure to pack Third Street. Third Street Promenade – Third Street Promenade is known more for its outdoor vibe than its shopping. While you’ll find some of the best stores here, you’ll be drawn more to the buskers, street performers and eclectic crowd than the shops. Thrifting Around Third Street – Off the beaten path (and down by just a block or two) is some really great thrift store shopping. Instead of spending hundreds on expensive brands, you can find some of last season’s outfits for an eighth of the price! Main Street – For more of a boutique experience, head to Main Street, Santa Monica. Filled with vegan shops, cafes and bars, you will find a ton of local businesses selling all kinds of things from organic spray tans to hip stationary to hipster threads. Twilight Concert Series – What if you could watch some awesome bands, chill with your friends and watch the sun set on the beach? Every year, Santa Monica hosts a concert series right next to the Santa Monica Pier. Hundreds of Angelenos come far and wide to enjoy the warm summer nights with some good food and tunes. Mainopoly – Unlike the typical board game, Mainopoly allows you to win no matter what. Your ticket buys you food, drink and community experience all while tasting the best of what Santa Monica has to offer. Plus, all proceeds go to Heal the Bay and Summer SOULstice. Santa Monica Pier Aquarium – The first stop on the pier is the legendary Santa Monica Aquarium. Unfortunately, the hours are short, but the cost is cheap and the experience is hands on. You can also volunteer with their Heal the Bay program that includes beach cleanups and working at the aquarium. Main Street Tree Lighting Event – Every holiday season, Santa Monica hosts a candlelight walk, tree lighting ceremony and a ton of local holiday parties on Main Street! A perfect way to connect with the community and get into the Christmas spirit early. Go Green – Santa Monica’s local scene is extremely eco-conscious. By recycling, volunteering for beach clean ups, driving electric and more, you’ll be able to blend into the social scene much better than your average tourist. Travel By Bike – Probably the best way to get around the city, most of Santa Monica is accessible by bicycle. It’s perfect for a sunny day, you get a more local sense, get some exercise and avoid paying high parking fees. Avoid Rush Hour – 5pm is not only when traffic on the 1, 10 and 405 freeways is the worst, but that’s also when everyone goes for happy hour from work in the Santa Monica area. If you’re looking to avoid crowds, try seeing some of these sites midday or on the weekends. If you like the crowds, just make sure you always book reservations as Santa Monica restaurants are always in-demand!